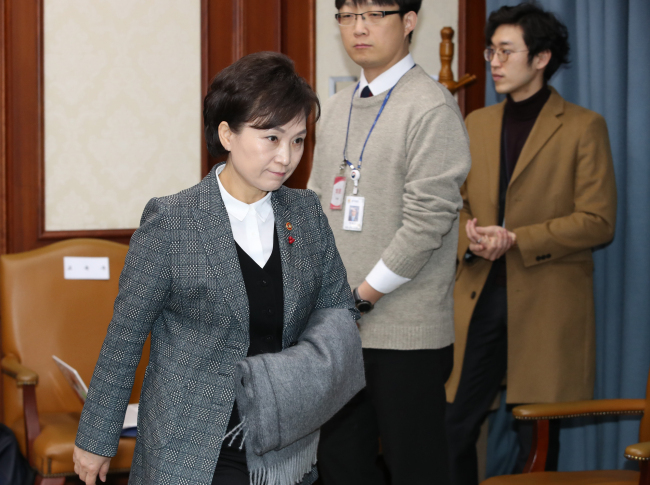 Transport Minister Kim Hyun-mee proposed in July that taxi drivers adopt an IT system similar to that of Uber in order to streamline their operations, but received no response, she said in a radio interview on Friday. “If you look at Uber service abroad, it is built to make reservations and pay through an IT platform and the drivers get (paid) for various supplementary services,” she said. “I believe that the nation’s taxi service will be improved if such a system is adopted,” she said, adding that she hadn’t heard from representatives of taxi unions. On the rationale behind the taxi drivers’ strike, Kim said their fears had little to do with the launch of car-sharing services, but fundamentally concerned their income structure. Of a taxi driver’s daily earnings, she said, the driver has to turn over about 135,000 won to the company in exchange for a fixed salary of 1.5 million won per month. “They get an average of 2.15 million won for working 12 hours a day. That’s even lower than the minimum wage,” she said. The minister said she wanted to maintain open lines of communication with taxi drivers and hoped they could work with the government and the political parties to improve their income structure. Meanwhile, on Friday Kakao said it was currently in talks with taxi unions about the proposed launch of a 10 billion won fund to improve benefits for drivers. But no progress has been made so far, the company said. About 100,000 taxi drivers were estimated to have participated in a nationwide strike Thursday, which included a sit-in near the National Assembly. They said they were concerned that the ride-sharing service could undermine their livelihoods by weakening their role in the transportation business.